Our Website requires you to be 18 years or older to enter. For Special Orders for processing and deliveries within Metro Manila, you may send us an email at contact@manila-wine.com. Thank you & Happy Holidays! We accept cash on delivery all over Metro Manila. 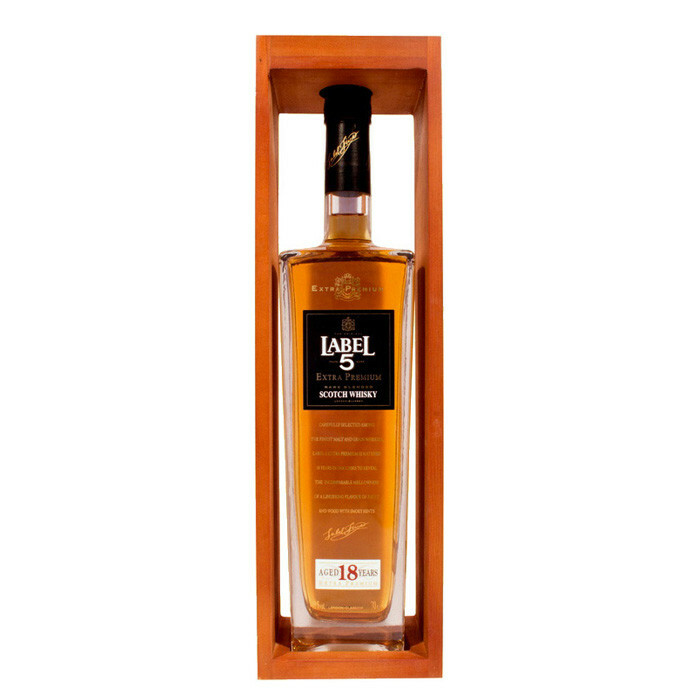 LABEL 5 Extra Premium 18 years old is an exceptional Scotch Whisky fully matured in oakwood casks for more than 18 years. This rare Scotch Whisky is elaborated from the finest and strictly selected malted barley with the utmost care of LABEL 5 Master blender. With it's polished, copper gold colour reflecting its age, this great whisky possesses a subtle aroma with notes of cedar wood, a slight hint of vanilla and a thread of smoke. The unreduced nose has a fine and uncomparably balanced woody scent and the smooth and creamy flavour of a home-made summer fruit sponge cake enriched with an appealing dusting of nutmeg. Nose: Lychees and sweet white grape. Palate: Immediately sweet with a slow implosion of peat that seems to arise from nowhere. Finish: Long, lingering, massive malt frame. We arrange the delivery of your purchase to the Delivery Address you provide. All Orders with Delivery Address within Makati City and BGC are free of delivery charges. A delivery charge of Php 150 is applied to Delivery Address in other areas of Metro Manila not mentioned above. Free delivery is applied only for all orders with a minimum amount of Php 4000 with Delivery Address in other areas of Metro Manila. We deliver your purchase right to your doorstep, anywhere in the Philippines. We find for you the right courier and delivery service company to guarantee a fast and efficient delivery of your purchase. Send us an email Click Here or call us at this number +63917 152 0505. Click the "Add to Cart" button to place the item into your shopping cart. Click the "Proceed to Checkout" button. Enter all the information then Click the "Continue" button.